Cosmological studies have shown the Universe's expansion is apparently accelerating rather than decelerating as expected due to gravity. Einstein's General Theory of Relativity requires that some mechanism must drive this expansion rate either through a new form of energy, such as a new vacuum energy density (cosmological constant), or a yet unknown kind of particle or field fundamental to the creation and formation of the Universe. The Wide Field Imager (WFI) Technology Reference Study investigates the potential architecture and technologies of a mission aiming to characterise this new form of energy. A mission concept was identified that consists of a 2000 kg spacecraft launched by a Soyuz-Fregat into a L2 halo orbit. The operational orbit at L2 is selected to maximize the observing efficiency and to provide a stable thermal environment. The nominal mission lifetime is 3 years, plus a possible 3-year extension. The Wide Field Imager will search for Type Ia supernovae (SN Ia) at low redshift in the optical and near IR part of the spectrum with the aim of measuring the changing rate of expansion of the Universe and determining the contributions of decelerating and accelerating energies such as the mass density, the vacuum energy density and other yet-to-be-studied dark energies. By fitting the obtained Hubble diagram with models, the WFI mission will be able to determine the contributions of decelerating and accelerating energies - mass density ΩM, vacuum energy density ΩΛ, and/or other yet-to-be-studied dark energies as the expansion rate changes over time. a low resolution integral field spectrometer operating in the same spectral range. The optical configuration of the WFI telescope consists of a three-mirror design with two folding flats that provides a large unvignetted field of view corrected for spherical aberration, coma and astigmatism. The WFI camera uses two detector technologies. The near- infrared (NIR) range (900 nm to 1800 nm) is measured with 72 HgCdTe arrays of 1450 × 1450 pixels each with a pixel pitch of 20 µm. The visible region (300 nm to 1000 nm) could be measured with deeply depleted back illuminated p-channel CCDs that are radiation hard. 72 such arrays with a 2900 × 2900 pixels each and a 10 µm pixel size would be needed. The camera's large (~ 40 cm × 40 cm) focal plane array (FPA) will be covered with 18 NIR filters and 72 visible filters deposited onto or in front of the detectors. Each line and each column of the FPA shall contain nine different filters. An integral field spectrometer with an image slicer is a candidate concept for the WFI spectrometer. The image slicer eliminates the need for a slit and greatly reduces the pointing accuracy required to place the supernova within the field of view of the spectrograph while preserving photometric accuracy because of its 100% filling factor. The spectrograph shall have a visible and near-IR arm within a single instrument. Its spectral resolution could be of the order of a 100 and its field of view of about 3 × 3 arcseconds. The maximum number of slices limited by diffraction would be about 15 in the near-IR and 30 in the visible. Gratings or prisms could be used as dispersive elements and the spectrometer camera could also benefit from the p-channel CCD and HgCdTe detector technology. The WFI spacecraft is composed of an upper payload module and a lower hexagonal service module that interfaces to the launcher. The payload module consists of a telescope structure and an outer tube. Both interface directly to the service module. The telescope tube carries two radiators that passively cool the focal plane detectors to 140 K and maintain their read-out electronics at room temperature. The telescope tube has no direct contact with the telescope structure. 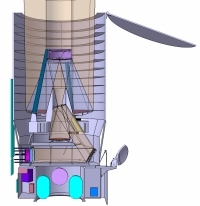 The WFI service module consists of an hexagonal structure that carries the power subsystem with 6 m² of GaAs solar cells, the telecommunication subsystem with a 0.4 m diameter high gain antenna, the propulsion subsystem with a monopropellant tanks, and the attitude and orbit control subsystem. The Payload Module consists of the telescope and the two instruments: the camera and the spectrometer. The telescope structure is organized around an optical bench that carries the M1, M3 and M4 mirror isostatic supports and the tripod interface to the secondary mirror. The optical bench also carries the instrument bay that contains the last (M5) folding mirror, a calibration unit, the wide-field camera and the integral field spectrometer. The required science data downlink rate is 40 Mbps at 26 GHz, requiring an upgrade of the ESA Deep Space Network to support reception of the 26 GHz Ka band. This study was completed in 2006. It was performed by SRE-PAM in cooperation with the Concurrent Design Facility, CDF.